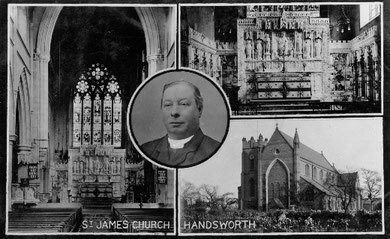 St James' church on the corner of Crocketts Road and St James's Road was built in 1838-40 on a site given by John Crockett of the New Inns and was greatly enlarged in 1895. The original church, designed by R Ebbles, was of stone in the Early English style with a low-pitched roof and consisted of nave and embattled western tower. It was restored in 1878 when a chancel was added. In 1895 a new nave was built south of, but taking in part of, the original nave. The new building, designed by J A Chatwin, included a south aisle and chancel, so that the church then consisted of chancel, nave, south aisle, north aisle (the original nave), north chapel (the original chancel), and north-west (originally western) tower. The additions of 1895 contrast with and dominate the original church: they are of red brick in the Decorated style, the nave has a semi-circular west end projecting beyond the west end of the tower, and the steeply-pitched roof of the new nave is slightly higher than the tower's battlements. 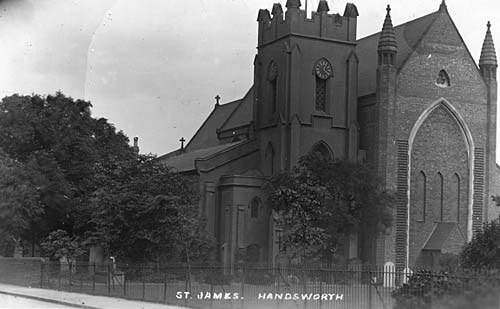 A parish was assigned out of St. Mary's, Handsworth, in 1854. The living was a perpetual curacy until 1868, and thereafter a vicarage, in the gift of the Rector of St. Mary's until 1891 when the patronage passed to the bishop. Parts of the parish were taken to form parts of the parishes of St. Peter, Handsworth (1907), and St. Andrew, Handsworth (1914).